I owe you guys not only a puppy update, but also a real recipe thread. We got hit by a cold snap this week and for whatever reason, it just zapped me of all my energy to do anything extra. I worried a lot about the ducks, since I had to keep them cooped while it was sub-twenties. And of course the dogs (along with me) had cabin fever. We did get a good walk in today. I still have to walk them separately, Scout is not ready for that just yet. This next week promises to be much warmer. Good thing, because I am ready to start cleaning my bed and get ready for gardening. I was sitting on the couch just now, with the dogs snuggled up, watching the sunset. I am still amazed at the beautiful view I have…thanks to some awesome tree trimmers. That helps tide me over until spring finally arrives. Cute duck story – I have a box of corn flakes, mostly for them, and I toss a few out for treats. The other day I decided to have a bowl for lunch. When I sat down at the table, there were the ducks, sitting on the steps, looking in the window. I have no idea how they heard me…they were happily playing across the yard before that. Silly ducks. 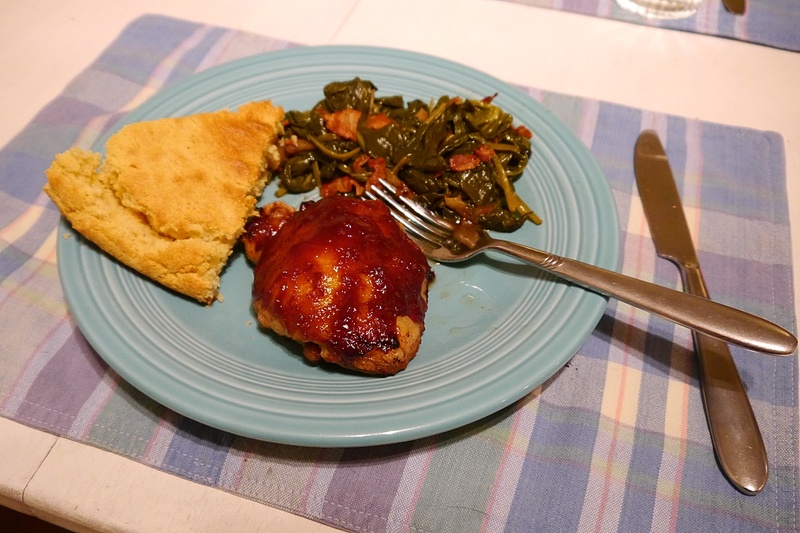 Pictured above is my quick dinner of BBQ chicken, cast iron cornbread (I cheat and use Krusteaz after a friend recommended it) and spinach with bacon. I’m not big on cooked spinach, but a friend loves it and never had it with bacon, so I had to make it. Add bacon to cold skillet and cook on medium heat. Fry until bacon is crisp (your desired texture, I like it still a bit chewy). Add the spinach, toss with bacon grease, add about 1/4 cup of water to create steam and cover. Cook until spinach is slightly limp. Remove lid and toss with salt, pepper and dash of vinegar (I like malt vinegar, but balsamic, white or red wine vinegar works well, too).